Love is in the air year-round for Michaela Margida. 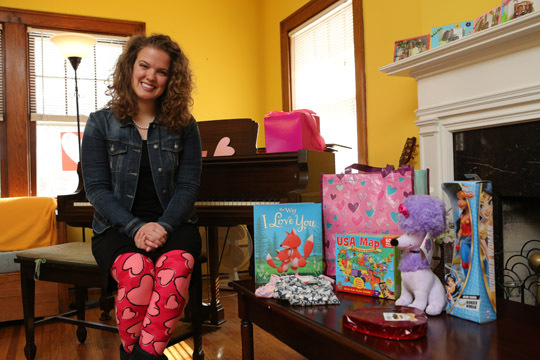 The 29-year-old University of Toledo PhD student who solves environmental problems through mathematical modeling prepares for Valentine’s Day with a passion to put a smile on the faces of hundreds of children with cancer or other chronic illnesses. Michaela Margida started the Valentine Project seven years ago to brighten up the holiday for children with cancer and chronic illnesses. Margida, a childhood brain tumor survivor, and her brother, Gregory, created the Valentine Project seven years ago. The nonprofit organization collects care packages from volunteers around the world and ships them to children’s homes in time for Valentine’s Day. It’s first year started with 80 children in Ohio. It has grown to nearly 1,000. The Valentine Project’s local drop-off point — Margida’s home in the Old Orchard neighborhood adjacent to campus — recently received a care package for a 5-year-old girl that includes a U.S. puzzle, Wonder Woman doll, stuffed poodle, book, heart-shaped box of chocolates, and a pair of Disney leggings. Margida and her mother, along with other volunteers, examine each donated care package to ensure all gifts are safe and age appropriate. They add to the packages, if needed, and then ship them to reach the children by Valentine’s Day. This labor of love is a way of giving back after the acts of kindness her family received when Margida was a little girl. When not organizing care packages, Margida is focused on her research in plant litter decomposition. “I am interested in what happens to the carbon dioxide stored inside leaves and other plant parts when they die,” Margida said. Before she arrived at UT, Margida worked as a marine biology teacher for middle and high school students in Sarasota, Fla. She also volunteered with Jesuit Volunteer Corps to teach lower-income adults how to manage their electric bill through using less energy in Baltimore. The Valentine Project is in need of volunteers and donations to help pay for shipping costs. Go to thevalentineproject.org to learn more. Registration begins in December to make a care package for Valentine’s Day 2019. This entry was posted on Tuesday, February 13th, 2018 at 3:58 am and is filed under Features, Natural Sciences and Mathematics, News, UToday .